Writing advice can come from the most interesting places. 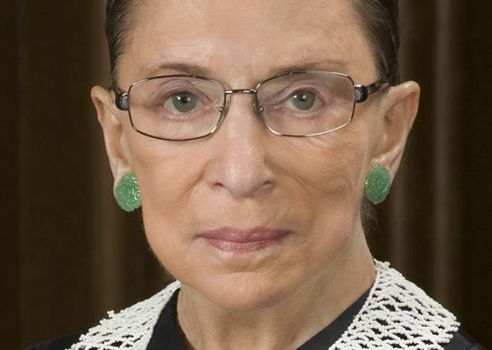 One such source is the famous American Supreme Court associate justice Ruth Bader Ginsburg…. I have long admired Ruth Bader Ginsburg (pictured above) — an associate justice of the Supreme Court of the United States. I like her feistiness, her clear writing style and her commitment to hard work. But when I read a recent piece of hers in the New York Times, headlined, “Ruth Bader Ginsburg’s Advice for Living,” it occurred to me that writers could use her advice, too. Here is one suggestion, taken directly from her column. [I am] often asked [the following] question when I speak in public: “Do you have some good advice you might share with us?” Yes, I do. It comes from my savvy mother-in-law, advice she gave me on my wedding day. “In every good marriage,” she counseled, “it helps sometimes to be a little deaf.” I have followed that advice assiduously, and not only at home through 56 years of a marital partnership nonpareil. I have employed it as well in every workplace, including the Supreme Court. When a thoughtless or unkind word is spoken, best tune out. Reacting in anger or annoyance will not advance one’s ability to persuade. I like this suggestion, and I try to follow it assiduously, too. It’s often useful in life to be a little deaf, but it’s a particularly handy tool for writers when so many others are eager to leap in and criticize our work. I think this occurs because most people read and thus believe they are fully qualified to pass judgement on the written word. Sometimes I wish I had been born good at math rather than English. So many people are so easily intimidated by numbers that if you have sway in that domain, no one is going to argue with you. To become better at writing it’s important to tune out most of your critics and focus instead on what you want to try to accomplish. But notice I’m not saying you should ignore all criticism. This is the beauty of Ginsburg’s carefully crafted phrase, “be a little deaf.” Be deaf to anyone who isn’t qualified to critique your work. But don’t be the least bit deaf to the handful of experienced editors and talented critique buddies who can suggest ways to make your writing better. Work-life balance was a term not yet coined in the years my children were young; it is aptly descriptive of the time distribution I experienced. My success in law school, I have no doubt, was in large measure because of baby Jane. I attended classes and studied diligently until 4 in the afternoon; the next hours were Jane’s time, spent at the park, playing silly games or singing funny songs, reading picture books and A. A. Milne poems, and bathing and feeding her. After Jane’s bedtime, I returned to the law books with renewed will. Each part of my life provided respite from the other and gave me a sense of proportion that classmates trained only on law studies lacked. Switch Ginsburg’s phrase “work-life balance” to “write-life balance,” and I think you’ll get the idea. Many people who want to become better writers or who aspire to write a book seem to feel that they need to quit their jobs or devote a minimum of four hours a day to the task. You do not become a successful writer simply by focusing on writing. Instead, you do it by making a modest amount of time for daily writing and then living your normal life. Did you know that if you write only 300 words (a moderate-length email) per day, five days a week you will have 78,000 words — a book — by the end of a year? Sure, you’ll still have to edit it, but you’ll have your crappy first draft which you can then turn into something much better. Never allow yourself to become so overwhelmed by the idea of writing that you fail to do it all. Instead, just make yourself a little bit of time for it every day. If this idea appeals to you, I’ll soon be opening the doors for the next term of Get It Done — my program that gives book and thesis writers the accountability they need to achieve their goals. If you let me know you’re interested today (just enter your name and email in the purple and green box on the page), I’ll notify you when registration opens. You’ll have no obligation, of course. My video podcast last week addressed the issue of how writers can find artists to work with. See it here and consider subscribing. If you have a question about writing you’d like me to address, be sure to send it to me by email, Twitter or Skype and I’ll try to answer it in the podcast. What do you think about the ideas of being “a little deaf” and “work-life balance”? We can all learn from each other so, please, share your thoughts with my readers and me in the “comments” section below. Anyone who comments on today’s post (or any others) by May 31/17, will be put in a draw for a copy of Metaphorically Selling by Anne Miller. Please, scroll down to the comments, directly underneath the “related posts” links, below. Note that you don’t have to join the commenting software to post. See here to learn how to post as a guest.